November 2017 Scorpio Horoscope foretells that the southern half of the horoscope is stronger this month. Your priority is for having a happy home life and a strong emotional quotient. Career is on the back burner for the Scorpios. You should use this lean period to make career plans for the future and devise ways to achieve them when planets are favorable. In November 2017 planetary power exists in the Eastern half of the chart for the Scorpio zodiac. Your autonomy and will power are very robust and you can dictate your terms to the world. If things are not happening as per your plans, you can just change them to suit your requirements. There is no need for social grace or adaptability. November 2017 is the time when the Scorpio sexuality will be at its peak. You will indulge in corporeal pleasures due to planetary aspects and your vitality is extraordinary. The 2017 zodiac prediction forecasts that your success in life depends on how you are able to balance your sensual desires with the other aspects of your life. You have to give equal importance to every aspect of life. Scorpio, your life is undergoing major transformations due to divine intervention and you are just a witness. You have to accept these things and move ahead in month November 2017. The 2017 November horoscope foretells that the Scorpio career will not be in focus this month. You can review your progress in business and make corrections to enhance future prospects. If you are seeking employment, you have to be careful about the offers you get. A thorough examination will be necessary as your Work Planet Mars is not favorable for business deals in November 2017. The November Scorpio 2017 monthly predictions foretell that presence of Jupiter in Scorpio sign will ensure monetary success during the month. More effort will be necessary and you will have to overcome a number of challenges on your way to affluence. You can become prosperous by improving your personal image. Movement of Jupiter will influence the Scorpio monetary situation extensively this month. Not only you earn more money, but will spend more on humanitarian causes in November 2017. Family and friends will help the Scorpio personality in improving their earnings and will contribute to their wealth. You should be careful in your spending in November 2017. The 2017 love astrology horoscope for Scorpio star sign forecasts that your personal charm and attractiveness will be very captivating. You will be able to draw people towards you easily. Here are a few Scorpio dating tips. At the same time people will be scared away by your excess enthusiasm. Scorpio compatibility in marriages will be great with news of birth of a child in November 2017. The Scorpio health will be exceptional and you will be spending more time on enhancing your personal outlook in November 2017. Here are a few tips to cure yellow teeth, remove wrinkles and have a softer face. 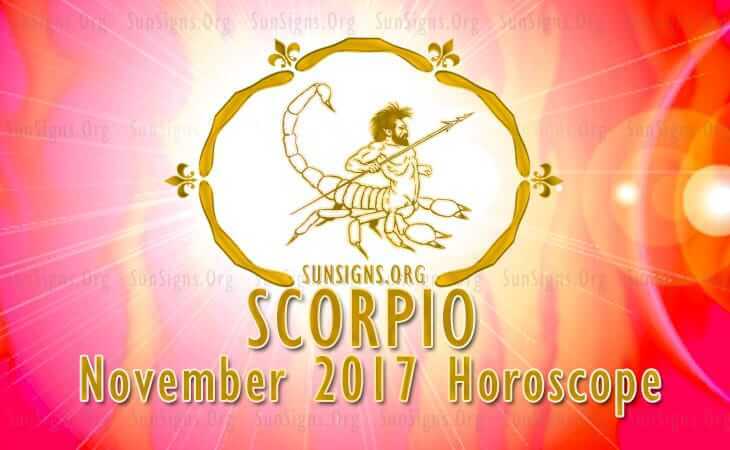 Scorpio November 2017 horoscope forecasts that you will be on the roll this month with everything happening according to your order.